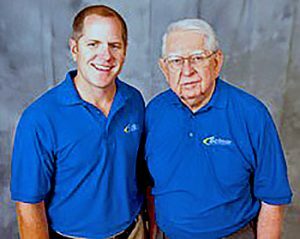 The story of Schneller Plumbing, Heating, and Air Conditioning is really the story of two families, two companies, and fate that brought them together. The first family are the Schnellers – Rudy and his wife Jean – who started their family plumbing business in Cincinnati, OH in 1928. That was a big year, historically. It was the year that Alexander Flemming discovered penicillin and Amelia Earhart became the first woman to fly solo across the Atlantic. It was the year Walt Disney introduced his most famous character, Micky Mouse, in an animated short film called Steam Boat Willie. The Schnellers launched their company just one year before Wall Street collapsed setting off the Great Depression. Those early struggles, and a need to do things right, lead Schneller to build his company based on a strong customer service reputation. The second family are the Knochelmanns. John Knochelmann started his plumbing and HVAC business in Cincinnati in 1968. He also built it based on a strong reputation for customer service. He already established a do-it-right-the-first-time work ethic. Kris Knochelmann, who worked in his father’s company since high school, says he learned about the importance of integrity and providing quality workmanship during those years. He worked in the office as a dispatcher, service manager, and finally, as general manager. John Knochelmann’s sons and son-in-law partnered up and bought the company in 1991. Then, in the mid-1990s the industry was challenged when Wall Street took an interest and began investing in HVAC consolidation companies. They were buying HVAC companies all over the country for high multiples. Many contractors took advantage of such offerings as part of their exit strategies. After nearly 10 years with Service Experts, Knochelmann explains that things began to change, and in early 2011 his position was eliminated. It was that change that brought the two families together. Just prior to this time of transition, Knochelmann had been looking to buy an HVAC company and merge it with the Service Expert business. Through a friend at church, he found out that Schneller Plumbing and Heating was looking for a buyer. So, in April 2011, he left the company his father started, and bought Schneller. Since then, he says almost 20 staff members from the old company have joined him, as well as many of his family members. “They came because we all shared the same belief: that customers should always come first and be treated with integrity. I am proud to carry on the tradition of my father and the Schneller family. 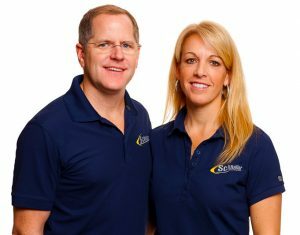 Knochelmann has owned Schneller now for nearly seven years. This April, the company will celebrate its 90th year in business. According to Kris Knochelmann, they focus on residential and light commercial HVAC system repair and replacement. Today the company enjoys gross sales around $8.5 million and employs up to 52 co-workers – 12 of whom work in the office and sales department. The rest are out in the field. 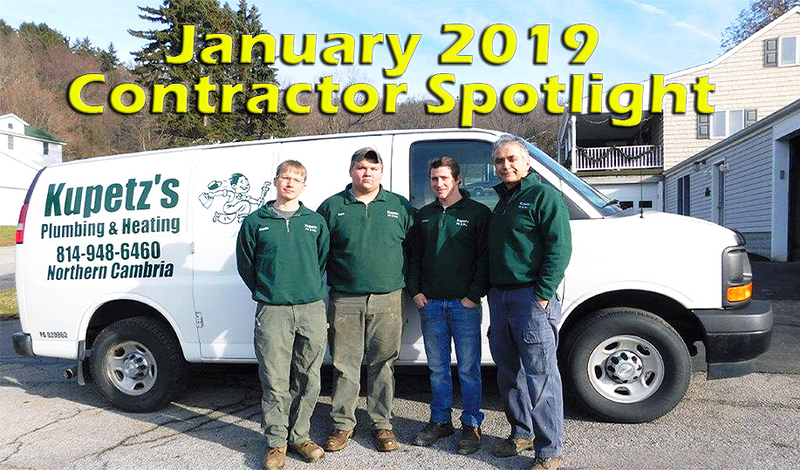 They have 34 service and installation vehicles serving their HVAC and plumbing customers from three locations – two in Cincinnati and one in Covington, KY.
Knochelmann adds that of the $8.5 million in gross sales, 15% comes in from plumbing and the rest is HVAC. 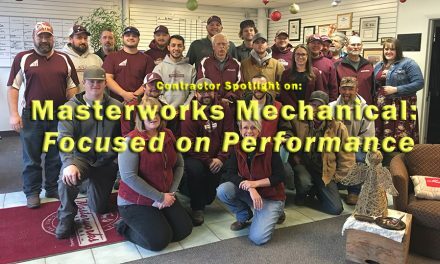 Kris and his team have been part of the high-performance HVAC movement since before the Schneller acquisition. He and many of his current technicians began training with National Comfort Institute (NCI) in the late 1990s. 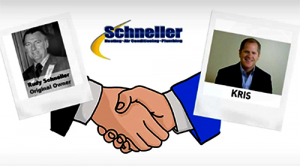 Once he bought Schneller, Kris officially joined NCI, and has remained a member in good standing ever since. “My family and the Schnellers have always focused on doing things right for our customers,” he explains. “That requires time and investment in training. I have always been a strong proponent of training. “From the first day of training with NCI, the idea of comparing static pressure to blood pressure caught my attention. 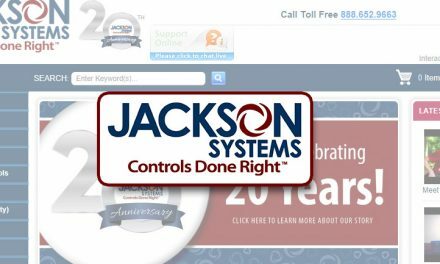 It really is a great way to help customers understand what is happening with their systems and what you need to do to correct it,” Knochelmann says. He adds that around 80% of the Schneller field crew has gone through NCI training and they work hard to make sure everyone stays up-to-date with their certifications. “Having said that, I feel we need to do a better job as a company keeping up with overall continuing education,” Knochelmann says. Kris poses with his father, John Knochelmann. Kris Knochelmann will tell you that education goes well beyond just the technical side of the business. There is always more to learn when it comes to managing the general business, employee interactions with customers, marketing, sales and more. Because of that, Schneller has memberships in a number of HVAC Industry trade associations, including Air Conditioning Contractors of America, Plumbing-Heating-Cooling-Contractors Association, the Kentucky Association of Master Contractors, and Nexstar. In addition, Knochelmann says reading is also so important. 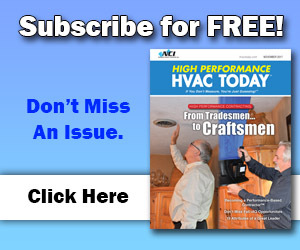 He reads most of the trade magazines that serve the HVAC industry and encourages people on his team, especially his managers, to do the same. So many industry experts will tell you that education is vital, but is all for naught if you don’t figure out how to implement what you learn into your company culture, and processes. Kris Knochelmann agrees. He says when it comes to standing out in your marketplace, you need to solve customer problems in ways that make you stand out. For Schneller, it comes down to executing Performance-Based Contracting™ through air upgrades and system/duct renovations. Easy? No way, says Knochelmann. “It is so important to talk to your customers in a way so they understand what the problem with their system is and what we plan to do to correct it. Using the NCI approach of comparing static pressure to blood pressure is as common and basic as you can get. If you don’t put things in those terms, 95% of your potential customers just won’t get it. If you don’t educate your customers, you only make it harder on yourself AND your customers. There is no question about that,” he says. Having said that, he admits Schneller still has a long way to go. “We don’t sell enough air upgrades. We have tried to make it less of an add-on service and more part of what we do. That is my goal. 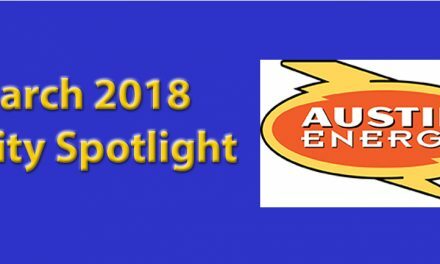 Besides customer education, Knochelmann says it is important that any new field service and installation personnel understand that their job is not just to sell the highest energy efficient furnace. It is ALL about resolving long-term comfort and efficiency operation. He believes this to be an important differentiator because it is where the rubber meets the road. 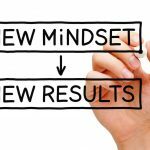 So how successful is Schneller Plumbing, Heating, and Air when it comes to selling air upgrades and duct renovations? Knochelmann says they have successes daily. Success is when his technicians are comfortable testing and diagnosing airflow issues and describing options to customers. Success is when the customer understands those options and feels confident they are making the best purchase decision. “I tell my guys that I’m not worried about them selling giant service tickets. Sure – if they do that is wonderful. 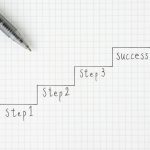 But if we can teach the customer and show them how to take the first step — whether it involves adding return air drops, performing a duct analysis, whatever – then we see that as success. When they understand that the work we do does take more time than just changing out a furnace or air conditioner and that changes the financial model, and they still want to move forward – that is success. “And because it is more expensive, you must know how to price it so you make money on it. By doing that correctly, you can hit the success button. If you don’t, you’ll do a lot of work for nothing,” he adds. Kris Knochelmann says he also measures success by knowing his team is doing the right thing. 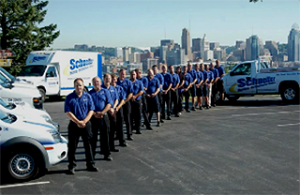 Schneller has three locations: two in Greater Cincinnati, OH, the other in Covington, KY.
“Once you understand air flow as taught by people with the integrity, you can’t go back to the old way of doing things. You must learn more, train more, and educate more. It’s like the first time someone shows you how to properly install or charge an air conditioner. You can’t learn it and then ignore it the next day. The new knowledge drives you to implement it. You have to make it who you are. And with NCI once you take a class, and learn the concepts, you can’t back away from it. You must move forward and implement day by day. When you do – that feels like success too. 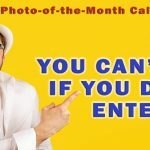 In the December 2017 issue of High Performance HVAC Today magazine, Contractor Tom Johnson wrote an article about becoming your local Carbon Monoxide (CO) evangelist (ncilink.com/CO-Expert). In it he explains how important it is to be safe and create safe conditions for your personnel and their homeowner clients. Though he doesn’t put it into those terms, Kris Knochelmann has his field service personnel undergo combustion performance and CO safety training. Today, the Performance-Based culture is stronger than ever in Schneller. 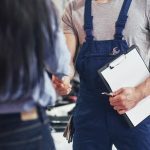 In fact, their maintenance agreement, which they call their PMA (Performance Maintenance Agreement) goes beyond typical HVAC service agreements. Knochelmann explains that the PMA is all about performance. It is one way the company tells customers that Schneller Plumbing and Heating is all about making systems perform the way they were designed to perform. “Performance means different things to different people,” he continues. “But performance, as taught by NCI, is now in Schneller’s culture. It is not about changing out boxes. It is our foundation to differentiate when we recruit, train, and send new co-workers out to customers.